Comments: Swift foxes are the smallest member of the dog family in North America. Adults weigh less than typical house cats. 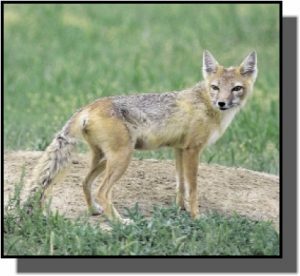 Resembling small coyotes, they have a slender body, long, pointed ears and a bushy tail with a black tip. Swift foxes live in underground dens with several tunnels, rooms, and entrances. Separate chambers are used for sleeping and storing food. Hunting usually occurs at night. Litters of 3-6 pups are born in late winter and early spring. They may live 5 years in the wild. Their most notorious predators are coyotes. Distribution: Swift foxes are found in arid and semi-arid regions from Mexico to southern Canada. They are found in the shortgrass prairies and rangelands in the western third of Kansas. Food: They feed on rabbits, hares, mice, rats, ground squirrels, insects, birds, and small reptiles.